Fourteen year old Marco Konegger from Spittal an der Drau, Austria is a talented young vocalist and actor who is making his move to stardom. What makes for a winning personality? What causes some young boys to overcome challenges and rise from obscurity to a place of notoriety or fame? What gives a youth the determination to go on and pursue hopes and dreams that seem to be just out of reach. You may think it would be a great host of family encouragement or being born with a silver spoon in your mouth. Or maybe enjoy the very best that a childhood could offer. But this is not the case with today’s featured young artist. 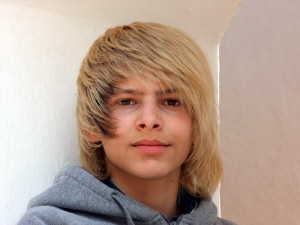 Fourteen year old Marco Konegger from Spittal an der Drau, Austria was a young boy living at home alone with his Mother. While this scenario has become all too common in the world, it does not make it any easier for those who have had this as part of their childhood experience.